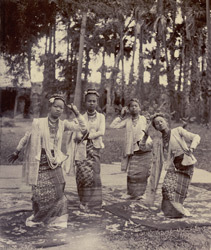 Photograph of a pwe or dance performance in Burma, taken by an unknown photographer in the 1890s. A pwe is a form of traditional Burmese performance combining music, dance and drama which was staged during pagoda festivals and by travelling troupes in rural villages. This is a view outdoors of four Burmese girls in classical dance poses, wearing traditional costume. The photograph is from an album devoted almost entirely to Lord Elgin's Burma tour of November to December 1898. Victor Alexander Bruce (1849-1917), ninth Earl of Elgin and 13th Earl of Kincardine, served as Viceroy of India between 1894 and 1899.